Pork tenderloin is a great, and often under-appreciated cut. It's fairly inexpensive, easy to cook, healthy (with about the fat of boneless/skinless/just-this-side-of-worthless chicken breast), and it's a wonderful blank canvas for all manner of experimentation. It doesn't take much to elevate this cut into something special, as I did here. Pork tenderloin is very lean (thus the healthy part), so it really needs some help in the moisture and flavor department. A brine is a great way to bring both to the party. This cut is also a great candidate for a finishing glaze, sauce, or in this case, a fruit compote. How can you possibly go wrong with pork, apples and rum? It's a flavor trifecta! For the starch in this dish I decided to try something completely new for me -- corn cakes. I used a medium-grind corn meal along with creamed corn to add a hearty and interesting textural component. When you're shopping for pork I strongly recommend that you look for a natural product that doesn't include "up to a 12% solution of (insert chemicals here)". If you see a label with that kind of verbiage, warning Will Robinson! If that's all you can find, just skip the brine. This may look like a lot of work, but it really isn't. 3 medium Fuji or Granny Smith apples, peeled, cored and diced to 1/3"
Combine all of the rub ingredients in a small bowl, whisk well to combine, and set aside. 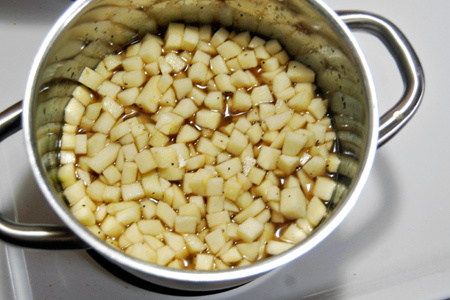 Make the brine by combining all of the ingredients, except the ice and cider in a large mixing bowl. Whisk until the sugar and salt are dissolved, then add the ice and cider. Remove any silver skin and excess fat from each tenderloin. Put them in a large baking dish or zip-top bag and cover completely with the brine. Refrigerate for at least two, but no more than four hours. Combine all of the compote ingredients in a medium sauce pan and bring to a boil. 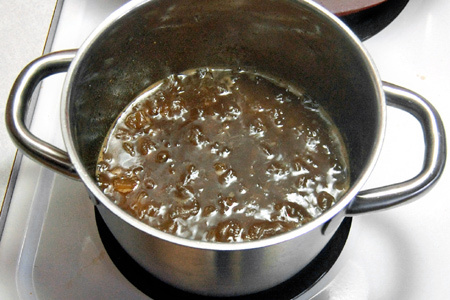 Reduce the heat to a simmer and let cook for an hour, stirring occasionally. 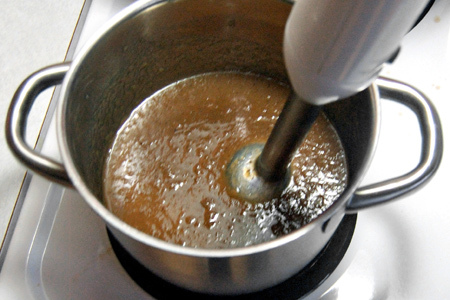 Blend the compote lightly with an immersion blender. You want to leave some small chunks. Cover and set aside. About 30 minutes before you're ready to serve, remove the tenderloins from the brine and pat them dry with paper towels. 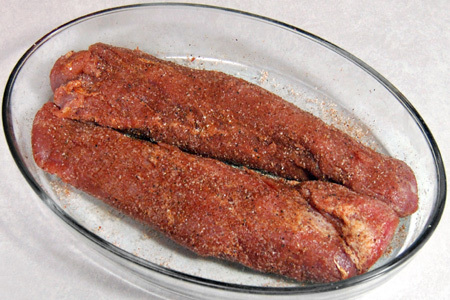 Put them in a baking dish or on a platter and coat all sides with a medium coating of the rub then set aside. While you're waiting for the grill, make the corn cake batter by wisking all of the ingredients in a medium mixing bowl. Cook the tenderloins indirect until they reach an internal temperature 140º, about 15 minutes, flipping once. While the tenderloins are cooking, make the corn cakes. Heat a griddle or cast iron skillet to medium-high, and your oven to warm (about 175º). Make the cakes by pouring the batter in about 5" rounds on the griddle or in the skillet. Cook them until all of the large bubbles pop, then flip them over and cook about 90 seconds longer. Keep the cakes warm in the oven. When the tenderloins have reached an internal temperature of about 140º move them to the direct portion of the grill and sear them for about two minutes per side. You're looking for a final temperature of 155º. Remove the tenderloins to a platter, tent loosely with foil and let them rest for five minutes. Cut the tenderloin across the grain into 1/4" medallions, plate on two corn cakes, and top with a good helping of the compote. can apple cider be substituted and why wouldnt you brine for more then 4 hrs? Fred - Both the brine and compote contain cider, so I don't know what you're wanting to substitute. If you don't want the rum, just replace it with the same amount of additional cider. 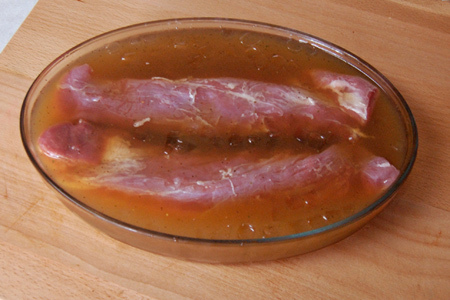 As for the brining, more delicate meats like pork tenderloin will get mushy if they're brined too long. Pork tenderloin is a huge hit at my place. I use the following jerk recipe. I use 5-6 seeded habeneros. I usually butterfly them and cook hot and fast. John, I'm always surprised how little respect the humble pork tenderloin gets in our circles. 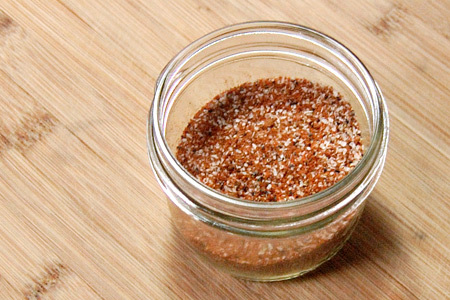 You hit the nail right on the head: it is a versatile, inexpensive and relatively healthy. Perhaps if we could get over our obsession with ribs and steak, we'd get to explore other cuts more. Nice one, John. Apples and pork do rock together. 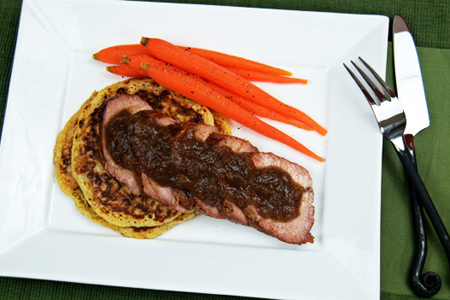 One of my favorite pork recipes is Adam Perry Lang's pork chops with an apple compote. Would I lose my "BBQ Card" if I comment on how perfect the carrots look in this picture? Very striking. Just boiled, shocked and seasoned or were they braised? What a great site! Need some advice on pork loin. I will be smoking larger pork loins (4-5 Lbs =/-) on a Weber grill, planning to serve about thirty people. I am thinking that I will need to smoke them for about 8 hours at 225 degrees. I am planning to use your recipe above. Are there any tips you can give me. Anonymous - I wouldn't recommend smoking a pork loin that long. Instead, I'd recommend cooking it just as I've described here (reverse-sear). Pork loin is very lean and doesn't lend itself to traditional barbecue cooking. Just think of the loin as a much larger tenderloin.